We descended to the canal via Wally’s Steps, off the A59 at the Old Roan. They were named after a local angler, Wally Crebbin, who fought the council in the 1980s to restore access to his favourite fishing spot on the towpath, after the building of new housing. 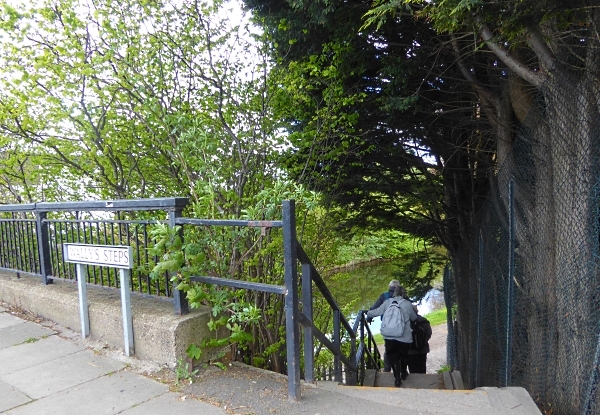 Wally died in 2008 aged 97, but his steps are now an essential part of the Trans-Pennine Trail. There were no unusual birds about on the water, just the usual Mallard, Coot and Moorhen. 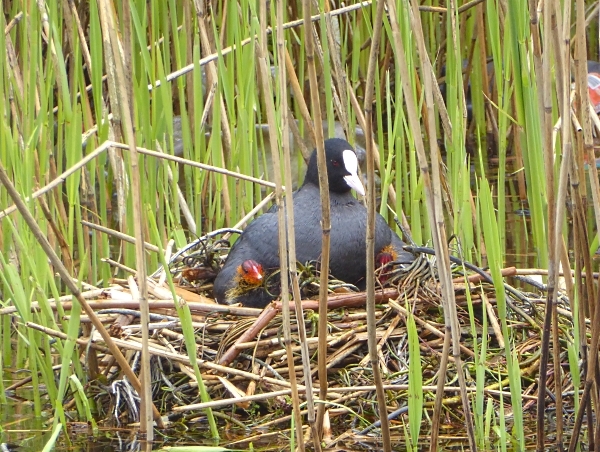 There were lots of Coot’s nests in the reeds, one apparently abandoned with a solitary egg, and this one with a mother and two punky red-headed chicks. 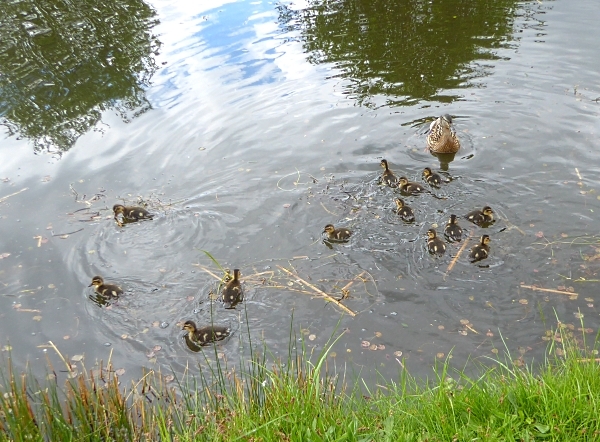 Several Mallards had two or three ducklings with them, but the prize was taken by this mother with thirteen! 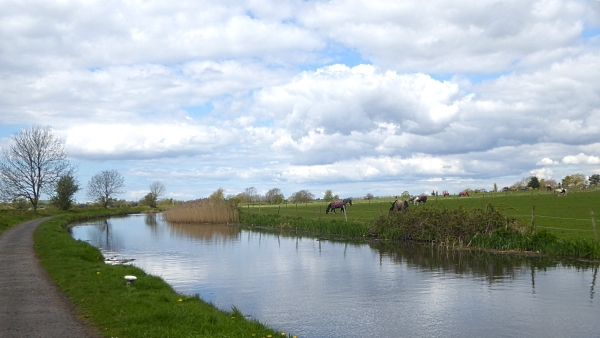 They stopped for birdseed, but when they were motoring along they took up the whole width of the canal. There were Bluebells coming out all along the towpath (not the native Bluebell, of course) and about a third of them were white ones. 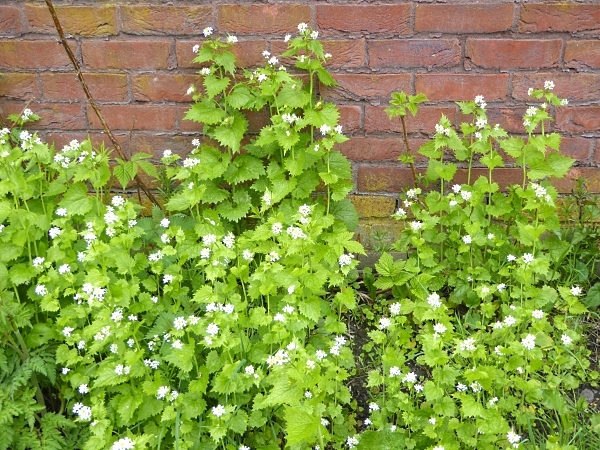 The Cow Parsley had nearly unfurled, and below it were White Dead-nettle, Red Dead-nettle, Ground Elder, Comfrey, Herb Robert, Chickweed, Ribwort Plantain, thousands of bright yellow Dandelions and absolute masses of Garlic Mustard, also know as Jack-by-the-Hedge. 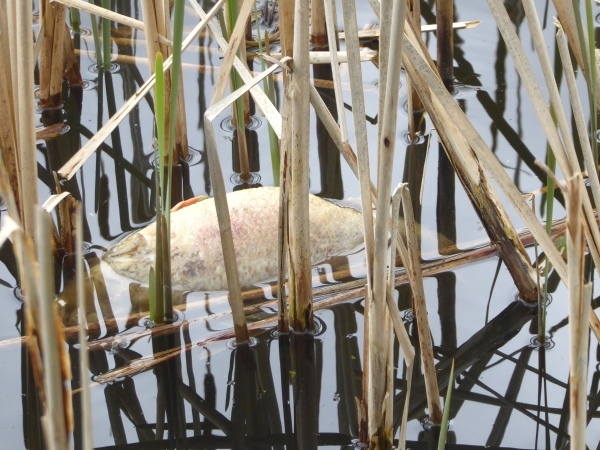 Corpse of the Day was a belly-up dead fish with red fins. A Roach? We saw another further along, too. Do they die natural deaths after spawning at this time of year, or was there something nasty in the water? 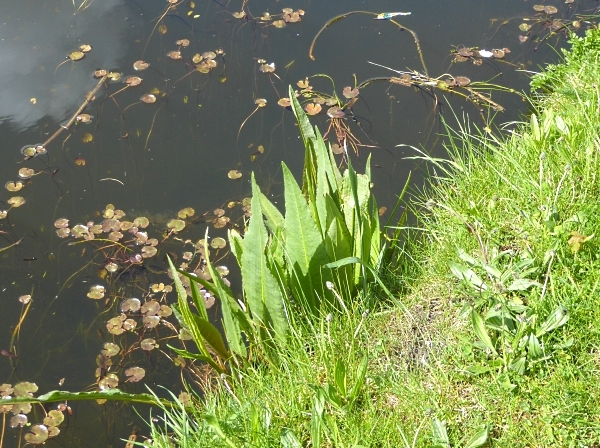 We were interested in a plant growing right on the edge of the canal, with its feet in the water. The leaves were tall and pointy but otherwise suggested Dock. The book tells me there is a plant called Water Dock that looks like that, Rumex hydrolapathum, so that was probably what it was. It was sometimes sunny, but with a cool breeze. Still hats and gloves weather. A few cyclists and joggers came past, but not the hordes that emerge on warmer weekends. 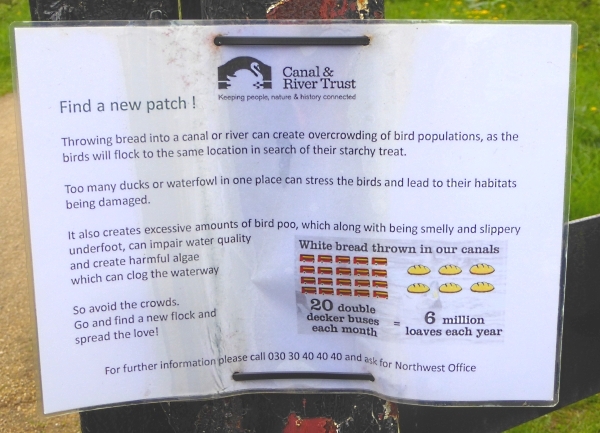 We lunched by Hancock’s Swing Bridge at Wango Lane and when we re-joined the path we saw that the Canal and River Trust have joined the fight against the feeding of bread to water birds, saying it “Doesn’t fit the Bill”. 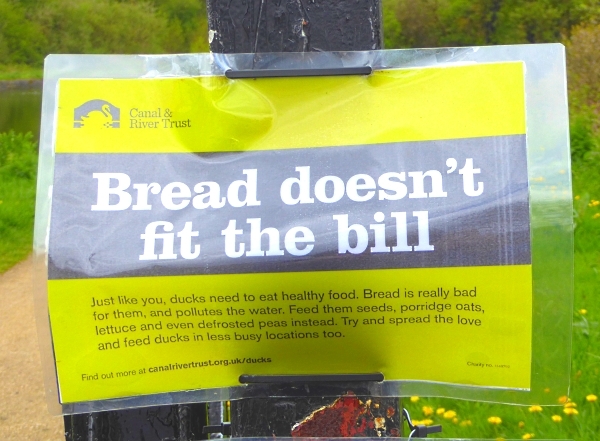 Their posters also urged families not to concentrate feeding in just a few favoured areas, but to “Spread the Love”. Clever, that. Trees starting to leaf or bud included Hawthorn, Ash, Whitebeam, Apple, Elder, white Lilac, and a tree with pale soft newly-emerged leaves and abundant flowers. 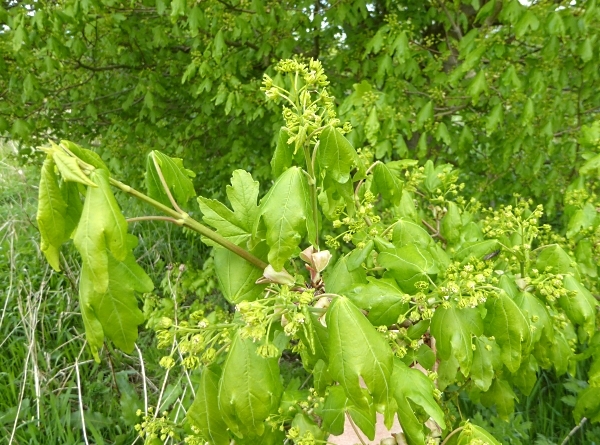 A Field Maple. We know it well later in the year when the leaves are dark green and shiny, but we didn’t know it flowered like that. We hoped to see Orange Tip butterflies, considering the abundance of their food plants Garlic Mustard and Lady’s Smock, but we didn’t see any butterflies at all today. 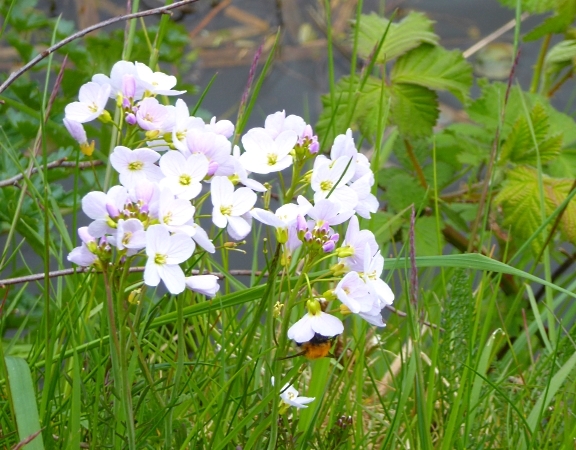 Lady’s Smock is also called Cuckooflower, Mayflower and Milk Maids, and was abundant all along the damp verge. It did attract a single bumble bee, though, with a dark abdomen and a gingery, hairy thorax. Although I didn’t get a proper picture to study at leisure, it must have been a Common Carder bee because the only other common bumblebee with a ginger thorax is the Tree Bumblebee, and that has a white ‘tail’. Apart from the waterfowl, there were the usual hedgerow birds like Robin, Wren, Chaffinch, House Sparrow and Blackbird. 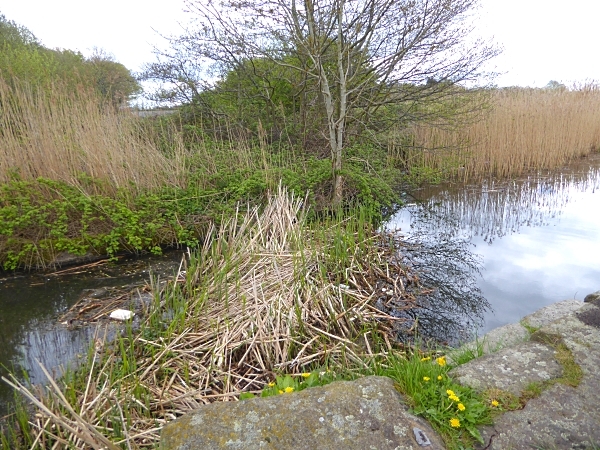 An occasional Reed Bunting flew from one side to another, where there were patches of reeds, while near Melling we stopped to listen to a stream of fast, scratchy chirps and cheeps coming from dense reeds on the other side. Without doubt it was a Sedge Warbler. We searched the reeds and brambles with binoculars, but Sedgies are notoriously skulking birds, and we never did see it. There was another one further along and we didn’t see that one either. Near Maghull, we spotted the old WWII pillbox guarding the railway bridge. Not far before that, at the site of the former Clare’s Swing bridge, the narrow place was completely blocked by reeds and debris. We had already commented that we hadn’t seen any narrow boats coming along, and that was why. It has to be cleared in time for the summer boating season, surely. Just before the end of the walk we passed the newly-restored milepost showing 12 miles from Liverpool. All the old mileposts were replaced and restored in 2016 for the canal’s 200th anniversary. We had seen the “9” just after we set out, so we covered over three miles today. Hard going for some of us, but at least it was flat! Then over the pedestrian bridge, past Frank Hornby’s house and we got to Maghull station just in time for the train. Public transport details: Bus 345 from Queen Square at 10.15, arriving Aintree Lane / Old Roan Station at 10.45. Returned from Maghull Station at 2.30, arriving Liverpool at 2.50.